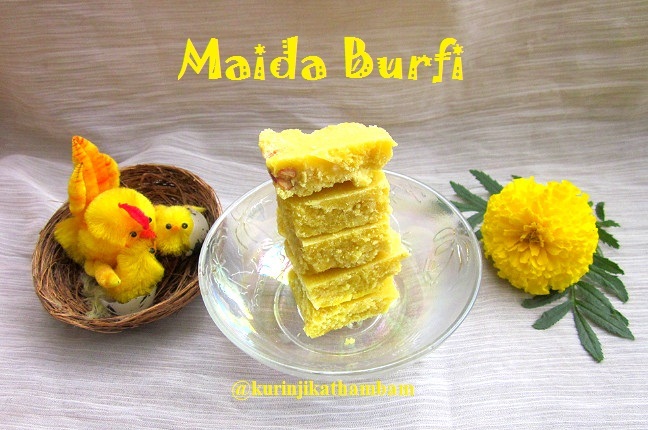 Maida Burfi is one of the easiest and quick to make sweet recipe. Maid Burfi is the ideal recipe for Beginners to try on festivals as it will come out very well in the first try itself. 1. 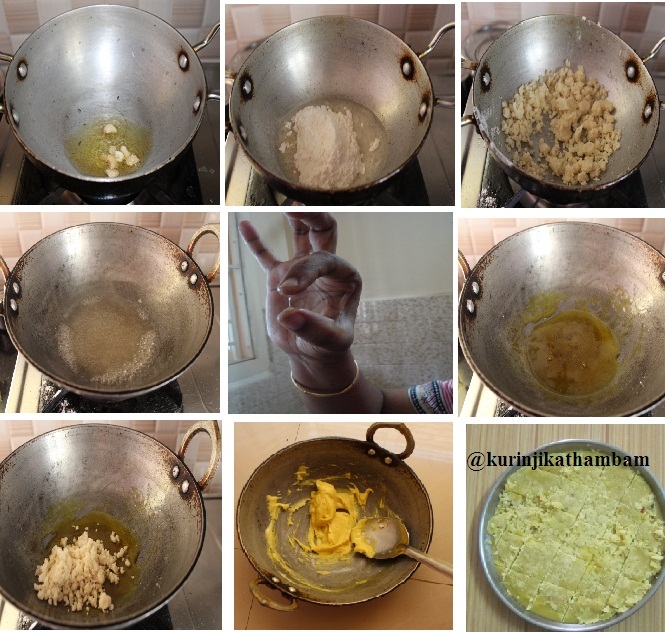 Grease the tray with 1 tbsp of oil/ghee and keep it aside. 2. Heat ¼ cup of oil or ghee in a pan, add cashew nuts and fry till they turn into golden color. 3. Then add the maida and stir well till the maida looks like bread crumbs. Switch off the flame and keep it aside. 4. Now add the sugar and water in a heavy bottom pan. Bring it into boil and cook in a medium flame till the sugar syrup reaches single string consistency. If you take the syrup between your two fingers and it forms a single string between your fingers is the correct stage. 5. Add the food color and essence / cardamom powder to the syrup and mix it well. 6. 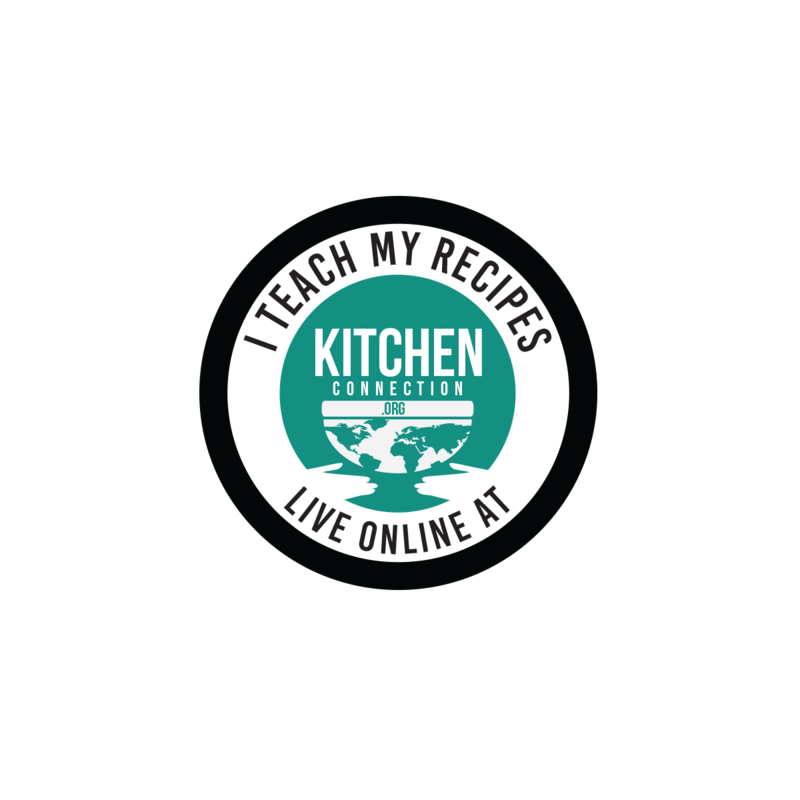 Immediately switch off the flame and add the fried flour (from step 1) and stir continuously without lumps using the spatula or whisk in a circular motion. 7. Stir till the mixture leaves the sides of the pan. 8. Pour this batter in a greased tray and level it using the spatula. 9. 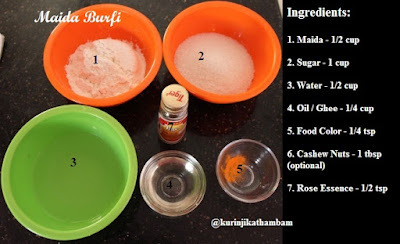 Cut them into squares using knife when the burfi is warm. Allow it to cool down and take the burfi from the plate. Store it in air tight container. Looks like a simple sweet.. perfect for diwali and other festivals.. First time on your space.. you have a very sumptuous collection..